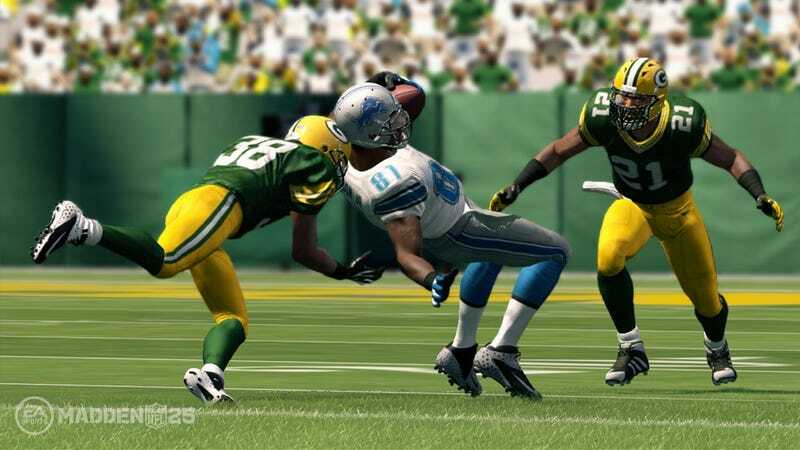 Last week, Madden NFL 25 announced an "Anniversary Edition" that at first didn't seem like it had much to offer. Then word started to circulate in an officially unofficial way that a promo code could be used to watch DirecTV's Sunday Ticket NFL broadcast on a PC, with or without signing up with the satellite provider. Well, this being Madden, this being big bad Electronic Arts and, more relevantly, this being the NFL and its less-than-consumer-friendly TV policies, few believed it. After all, the official news release doesn't straight up say this is how you can use the offer, which seems to be more about giving a discount toward a DirecTV subscription. The code, which gives Sunday Ticket access on PC, tablet or mobile phone, is referred to more or less as an alternative for those who cannot receive DirecTV service. Considering DirecTV has 35 million subscribers, there would seem to be few in America who can't get it, but it's true in the case of dorm rooms and some apartment buildings where you can't mount a dish. So, through the past week word spread that this was going to be a screwjob. You'd buy a hundred-dollar Madden and be unable to use the thing you really wanted because DirecTV would know, by zipcode or IP address or whatever, that its service was available to you. I'm not ordinarily in the business of policing special edition offers but this one, being enticing to me on a personal level (I have no cable or satellite TV but watch a ton of sports over the Internet), was interesting enough I went to the man putting his name on this unofficially official offer: Anthony Stevenson, Madden's top marketer. I asked Stevenson if I could use this code to watch Sunday Ticket on my iPad even if I had no intention of signing up with DirecTV. "There is a unique code in every single anniversary edition, and that code will entitle you to the 17-week full-season trial on PC, tablets and mobile devices," Stevenson said, and I started grinding my teeth. Why can't we get a simple yes or no? "We absolutely understand there is some confusion with the language, and how it is written," he said. "To bring this great deal to life—it's very complex and complicated, involving the NFL and its television partners, and DirecTV. The reason is because everyone's interests have to be protected and this has to be written in a certain way." There's a lot of reading between the lines here. So I'll say what Stevenson could not above: Sunday Ticket is not a thing greatly loved by networks that have paid billions-with-a-b to broadcast Sunday afternoon games. To straight-up invite people to ditch a television set altogether and watch this stuff online, while it may be within the terms of DirecTV's deal with the NFL, is a provocation to its biggest licensing partners. Hence the unofficially-official offer, and the heavily lawyered wording of the news release and the line Stevenson must toe. The "unable to get DirecTV service" thing is just a fig leaf that allows DirecTV to put out this service, and then let you figure out how to exploit it. You self-select whether or not you have DirecTV access. Protip: Say you do not. Really, how is it going to know? It doesn't matter if there's a contractor in the area to connect you. Maybe you have a landlord that won't allow you to mount a dish to the house you rent. This is how it works when you use the Sunday Ticket app on the PlayStation Network (note: This offer does not give you access to the PS3's app.) Sunday Ticket on a mobile device is otherwise only possible if you sign up for the deluxe "Sunday Ticket Max" package, which requires a DirecTV subscription. This is a code that essentially breaks off that feature and gives it to you for $40 above Madden's cost. Madden special editions have been, candidly, kind of a snooze up to now. They get a different, sometimes prettier cover and some exclusive in-game content, usually for the Ultimate Team mode (and there's a bunch of that in the Anniversary Edition, too.) This, though, has legitimate value. I almost pulled the trigger on getting Sunday Ticket on the PS3 last year, but didn't, because I work weekends and my lone TV is in a room well away from my office. That changes if it's on my iPad here at my desk. No extra TV, no cable or satellite subscription. So, I'm going in on this, even if I get a copy of Madden free in advance to review. And if I get screwed, well, I know where Anthony works and what he looks like. I'll say hello for you.